How do you sell this team to fans? If two fans were standing here right now and asked, ‘Why should we spend our money to go see your product?’ What do you tell them? First I’d tell them that when you get to Safeco Field you are going to have a safe, friendly environment. You are going to be sitting in a first class ballpark. You are going to get great entertainment. It’s a great place to come whether it’s at the Pen or at Edgar’s or wherever. So there’s a lot of things going on at Safeco Field for the fans to enjoy besides watching major league baseball. And I would point that out to them. Many of our fans are thinking about things other than just what’s on the field, so we have to provide a really good entertainment experience across the board as well as getting that major league team to perform. 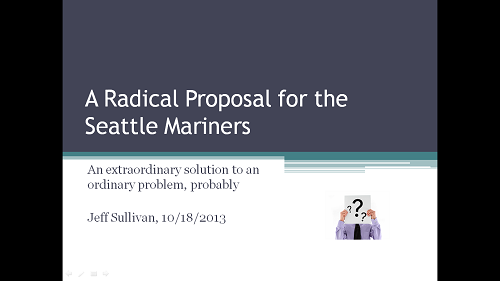 2) Build a stadium that will allow the Mariners to be competitive and financially viable? The choice between those two options was actually on the ballot. At the same time the stadium was coming up, Seattle was thinking about another huge project: the Seattle Commons, in what’s now Amazonia. The proposal for the Seattle Commons was to create a beautiful, safe, park everyone could be proud of — as Cleveland’s Jacobs Field was offered as an example of what a new modern baseball field could do, so the Commons would bring the city together as Boston’s Commons, or New York’s Central Park. This is almost same-variety-of-apple-to-apple comparison. Seattle Commons lost (57/43), and was not rescued by legislators afterwards. What if you had pitched the ballpark in the way that Howard Lincoln does now? Read everything, or anything, John Ellis and the Baseball Club of Seattle said, from the first ask through the part where they sued the city for no reason, all the way to the opening of the long-awaited stadium. What’s the message? We did get that after Safeco opened. It’s hard to remember sometimes. And then… this. I know it’s unrealistic to expect any team to be competitive year-in-and-year out. Since 2003, though, we’ve had ten years of awful. Ichiro and Felix toiling in futility. The highest executives of the Mariners scoffing at the A’s, who this year again went to the playoffs in a season where the M’s lost over ninety games. The Mariners weren’t provoking any sort of emotional response at all, and that’s supposed to be my most favorite team. I didn’t just not want to watch them; I actively avoided them, and I recognized my own behavior. But it turns out it wasn’t baseball — it was the Mariners. The Mariners were downright unwatchable for stretches. I’m sitting here, watching the playoffs, and it’s incredible. I haven’t gone to a Mariners game since I saw Ichiro in a Yankees uniform, in right field, here in Seattle, that first game after the trade. I loved baseball, and after that game I never felt the urge to go, or watch it. Then on vacation, I was eating dinner in a bar with the game on, and I felt the same way Jeff did — it was incredible. We shouldn’t be hopeless. We should be angry, and demand better. There haven’t been changes at the highest levels because we managed to give the team the financial security they desired, and now it is a defense against recognizing their problems — if anything, it has allowed the team’s highest people to crawl further and further back into denial that there’s any need to change. If two fans were standing here right now and asked, ‘Why should we spend our money to go see your product?’ What do you tell them? I tell them do not spend your money to go see your product. It’s clear the team takes entirely the wrong message from each dollar spent. We can’t break our side of the contract and take the stadium or the team back. But we can remove that financial security. In concept. In price, the Commons was a relative bargain. Seattle Commons price tag? $111m for a 60-acre park. People were skeptical of the cost, which… well, you saw what happened with Safeco Field. The sheer difference of the prices makes the contrast in support even more stark. If the Commons had gone on the ballot at $340 million, how poorly would it have fared? Is there? Was that something that got dropped in the renegotiation that caused Shelly Yapp to resign? Finalists for the 2013 Gold Glove Awards were announced Friday, and the Mariners didn’t have anybody included, because they weren’t good. They did, however, have a pair of finalists for the 2013 Gold Shoe Awards. Congratulations, Raul Ibanez and Michael Morse. Even if you don’t end up golden, your cleats were certainly made of some kind of metal. Maybe the most important thing the Mariners have to do all offseason is hire a new manager to steer the team going forward. Or maybe that’s literally the least important thing on their to-do list. Who among us can say? Keep this point in mind. It’s kind of the whole point of this post. The Mariners have to hire a new manager because they couldn’t reach an agreement with Eric Wedge. That would be one not incorrect way to put what all happened here. The Mariners have already started interviewing candidates, and the names they’ve been linked to are mostly the names every team is linked to when they have a managerial opening. This should be settled within a matter of one or two or three weeks, and then we’ll officially know the name of the team’s next major scapegoat. While the Wedge chapter arrived at a weird and uncomfortable ending, my sense is that fans aren’t too broken up over losing him. He didn’t make the Mariners win, after all. He didn’t feel like a good manager. And Wedge was in the news today. Turns out he’s going to interview for the open Chicago Cubs position. He isn’t thought to be the favorite, but he’s going to get himself in the offices, interviewing with another team trying to progress from rebuilding to contention. On its own, that isn’t so remarkable, but the reason I bring this up is because of who’s running the Cubs these days. The Cubs have turned themselves into one of baseball’s more forward-thinking, analytical organizations, the kind of organization we thought we had here a few years ago. The Cubs seem like they’re doing things right. They’re going to interview Eric Wedge. Many people here were unimpressed by Eric Wedge. What the hell do we actually know? That’s the question I always inevitably come back to whenever I’m reading about a managerial hiring process. What we know are the names of candidates. We can research their histories, and we can pay attention to whatever quotes they might offer. We can’t do any analysis. Even if a track record exists, we don’t know how to interpret it. At least from the fan perspective, the managerial hiring process is like ordering off an indecipherable menu, a menu written in hieroglyphics. You can try to figure something out from what you’re presented, but you’re not going to know anything about the entree. You’re lucky if you figure out a single ingredient. Also, the cooks in the kitchen change by the day, so you don’t know the conditions responsible for your meal. And after the meal, you don’t actually know if it was good. You know whether you had a negative or positive overall experience, but you don’t actually know why. Stretch it far enough and this simile kind of falls apart. The most insane thing about managers is also the most obvious thing. We have no idea who’s good. We have no idea who’s going to be good. We have no idea who was good in retrospect. We don’t know how much a manager actually matters. We don’t know how much depends on the environment into which a manager is placed. It stands to reason someone who’s a good manager with Team A might not necessarily be a good manager with Team B. Players are different, mood’s different, situation’s different, manager performance is different. We don’t know a damned thing. I’m not even convinced the teams doing the hiring know a damned thing. I mean, yeah, they’ll come away with some preferred candidates, based on the interviews, but those teams can’t tell you what difference the next manager should make. If the Mariners picked up Mike Trout tomorrow, they’d be, I don’t know, eight or so wins better. If the Mariners hired Chip Hale tomorrow, they’d have hired Chip Hale, and that would mean something or nothing, and we’d never know what it meant. Gun to my head, I’d say the best manager in baseball is Joe Maddon. I’ll freely admit a lot of that is just based on results, and he makes some tactical mistakes, and I’m just biased in favor of the demonstrably open-minded. I feel like Joe Girardi did a great job in New York this year, but I don’t know. I used to think Mike Scioscia was phenomenal, but more recently people have wanted him fired because the Angels, who always overachieved, have underachieved. Terry Francona was apparently good for a while and then suddenly ineffective and he had to go somewhere else to be welcomed. The point is that the whole damned thing’s so mysterious I can’t believe people following a hiring process end up with rooting interests. Who can really pick a favorite managerial candidate? Or, who can reasonably support such a pick? Every year, this is such a big story for a handful of teams. It feels important, getting a new manager and coaching staff in the dugout. It’s also a story that’s just about impossible to discuss. It should always be reported on — it’s something that’s happening, after all — but what is there to be done beyond the reporting, save for repeating the reporting? How are we supposed to know who could work here? How are we supposed to know how well someone could work here? How are we supposed to pretend we know anything? This isn’t an original topic, and I’m far from the only person who feels like this. It’s just kind of mind-blowing to me, every time. Here’s this thing, this seemingly important thing that’s happening with the Mariners, and, welp. We’re frequently made to look stupid by baseball when we make our projections or whatnot, but at least we can have facts on our side and the knowledge that over bigger samples, we’ll be right more than we’ll be wrong. There aren’t any facts with managerial candidates, not facts that we know what to do with. So there’s this sense of feeling like I ought to have an opinion, but knowing that I shouldn’t. I’d like the Mariners to keep away from Dusty Baker, but even that I can’t support with meaningful data. It’s just an automatic response. Pretty soon, the Mariners are going to hire a new manager, and we’ll never have any idea how good of a job he did here after it’s over. We’ll know how the team did and that will color our feelings, if not determine them completely, but that won’t be good analysis. The truth is it’ll forever remain a mystery, or at least effectively forever. Maybe you personally don’t trust the Mariners to hire the right candidate. Who would you trust? A team I’d trust is going to interview Eric Wedge. If there was one thing that felt absolutely inevitable, it’s that we were in for weeks and maybe months of Tim Lincecum to Seattle rumors. People in Seattle, maybe more than any other MLB city, absolutely yearn for every kid with anything close to a local tie to end up in a Mariners uniform. Lincecum was a star at the University of Washington, and a lot of people are still upset the Mariners passed on him in favor of Brandon Morrow way back when. Finally free to make his own choice about where to live and work, it seemed like Seattle would be high on his list of choices. And the Mariners, even with Taijuan Walker and James Paxton hanging around, need to improve their rotation. It seemed like a match made in Obvious Heaven. Tim Lincecum cares not for the narrative, apparently. Today, before testing the free agent waters, he re-signed with the Giants for another two years. Why would he do that, you might ask? Because the Giants gave him $17.5 million per year and a full no-trade clause in order to stick around. Yes, Tim Lincecum, coming off a couple of years of near replacement level performance if judging by runs allowed, was just guaranteed $35 million for the 2014 and 2015 seasons. A pitcher thought to be perhaps an interesting buy low candidate for teams looking for value instead turned out to be a pitcher who was in line for 70% of Felix Hernandez’s annual salary. Tim Lincecum will get more money next year than Hisashi Iwakuma will get from the Mariners for his first three seasons with the team. There is no buying low here. The Giants are paying Lincecum as if he’s just been humming along as a high quality pitcher with no real bumps in the road, at least in terms of annual salary. Without the bumps he’s actually hit, he’d have gotten this kind of salary for 5+ years, so the discount came in settling for just two. But, still, there’s no way the Mariners should have been interested at this price. I wrote today over at FanGraphs that there was little difference between Lincecum and Dan Haren, who is expected to sign for something in the range of about half of what Lincecum just got. Today’s deal for Lincecum almost certainly upwardly revises the asking price for Haren, but he’s still not likely to get anything near this kind of deal, and the Giants may have just saved the Mariners from getting guilted into making an overly large commitment for a pitcher with some real warts. So, yeah, no Tim Lincecum in Seattle. At $35 million for two years, I think we can consider that good news. This is something I saw. It’s not what’s important. Lloyd McClendon, who interviewed with Mariners for managerial job last time around, is expected to be a candidate in Seattle again. Rather, it got me thinking, and it got me thinking about this poll! This poll right here, asking for your mass participation! This is rather bizarre, in a sense it’s a personal matter and tangential to the team itself, but at the same time it has potential implications for roster and clubhouse dynamics. The Seattle Times is reporting that Carlos Peguero’s wife (who is, incidentally, the daughter of Pedro Borbon, one of the let’s say more unusual characters in baseball history) has been charged in federal court with wire fraud based on alleged misuse of a debit card belonging to King Felix’s wife. Got that? Okay, to begin with, innocent until proven guilty, let’s respect that. The charges are based on purchases made in 2012, although it’s not clear from the report when the issue was discovered. It’s before Felix signed his latest extension, although he was already making enough money that $180,000 from Saks could be overlooked. I’m sure he knows some of the dangers for people that wealthy in determining whom to trust, and has professionals managing his finances as the story indicates, but normally you would be most wary of outsiders trying to weasel in, not necessarily people already connected to the team. Being human, players can have their performance affected by family issues, not that Felix would likely ever admit to this as an excuse. Statistically, of course, it’s impossible to evaluate because you can’t verify or reconstruct many of the factors involved, but the impact is real enough to the person going through the experience. Peguero has told investigators he didn’t know about the purchases. The presumption of innocence should hold up all the more so for someone not charged with any wrongdoing, so let’s take him at his word. It’s not out of the question that Felix might accept that too and they could coexist, men could be teammates and friends and many other things even when their wives don’t get along. The team has declined to comment, as you might expect. We have no way of knowing how long they’ve been aware of the situation or what impact it might have on their decisions. Any fallout we might speculate about can just as easily have a much more straightforward explanation. We don’t know if they found out during spring training, or maybe after Peguero spent a week with the team in April, or much more recently. Despite the ongoing disasters in the outfield this past season, Peguero was not at any point the best available solution and overlooked. His lack of development means nothing seemed unusual when he didn’t return, even with expanded September rosters, and his performance at Tacoma never really demanded a callup. He’s now out of options and wasn’t likely to have a future with the team regardless. Perhaps Zduriencik moves on over the winter (he’d be a great candidate to follow Wladimir Balentien to Japan), or else he comes back in spring training for one last try, awkward though that may seem now. 1: With the playoffs still underway, it’s too early to know who’s in the free agency pool. Teams have a few days to submit qualifying offers, and players can mull over taking the money or opting for free agency (as Kendrys Morales evidently will). But international players aren’t subject to these rules, as the collective bargaining agreement obviously doesn’t apply. That’s the reason Jose Abreu’s in the news today – the Cuban slugger reportedly signed a 6-year, $68 million deal with the White Sox – apparently a new record for an international free agent signing. As Dave’s article (linked above) mentions, the quick success of Yoenis Cespedes and Yasiel Puig undoubtedly influenced the market for Abreu, a 1B/DH. Previous imports have often failed to live up to the hype, as all of us who lived through the Yuniesky Betancourt era can attest. The White Sox know this better than most, as their starting LF, Dayan Viciedo, was once a highly anticipated free agent. Viciedo cracked the Cuban national series at the tender age of 15, and was a triple crown threat at 16. A Puig-ish build and plenty of raw power led some to project 30-HR power in the majors. Unfortunately, Viciedo’s in-game power’s been slightly below forecast, and coupled with a lack of patience and uninspiring LF defense, Viciedo’s turned into a ~ replacement level player (albeit one with some upside; he’ll be 25 next season). Abreu’s shown much more in-game power to date. While Viciedo knocked an impressive 16 HRs in the short Cuban season several years ago, Abreu hit 33 in 2010-11 to set the Cuban record, and upped that to 35 HRs in 11-12 (though Alfredo Despaigne re-took the record with 36). * The season was shortened last year to accomodate the WBC (where Abreu again destroyed so-so pitching), but Abreu is clearly in the top tier of Cuban hitters. Clearly, Abreu can dominate Cuban-league pitching, and he’s been a terror in international competition, but scouts are still split on his ability to handle elite velocity and location. Of course, that’s true of literally anyone- elite velo/location are, by definition, not things that even most MLB pitchers have in their arsenal. Some teams, including the White Sox, think the soon-to-be 27-year old has a short swing that will allow his power to play against anyone. Others think his complicated pre-swing routine and possibly average batspeed will prevent him from squaring up big league pitches. Dave’s post also points out that Abreu will have to hit *a lot* to pay off. As a 1B/DH, he can’t add value as a league-average hitter. It’s an interesting gamble, and it’ll be fun to watch the White Sox three Cuban players next year – will Abreu help Viciedo develop? Will Alexei Ramirez remember how to hit for power, or is he still frazzled by his up-close encounter with a Tom Wilhelmsen curve ball? The money seems fairly high for a guy with some batspeed questions, but it makes more sense given the paucity of options on the MLB free agent market, and the fact that the White Sox won’t have Paul Konerko’s contract in 2014 (and Adam Dunn’s deal comes off the books after next season). All told, it’s probably a gamble worth taking. 2: The other highly-anticipated international player to hit the US is Japanese pitcher Masahiro Tanaka. If you read my article on Wlad Balentien, you’re aware of the “juiced ball” controversy in Japan this year, and how offense was up after two seasons in which pitchers dominated. Gaudy ERAs were more common in 2011-2012, with Yu Darvish’s 1.44 figure (his 5th straight year with an ERA under 2) talked about a lot before he was posted. Try to keep that context in mind when you look at Tanaka’s 2013 numbers here. Tanaka, who turns 25 in a couple of weeks, went 24-0 with an ERA of 1.27 in 212 IP. Those are old-school stats, and the league context is different, and he played for a good team, etc. etc. But this was the year the commissioner resigned due to the ball inflating offense *too much*. Tanaka had an above-average season, is what I’m trying to say. He may be posted this year, and the Yankees are apparently willing to forget the Kei Igawa experience and go all-in on Tanaka. The Yankees have seen first-hand how a splitter-throwing righty can take the short fences of new Yankee stadium out of play, and they’ve reportedly had scouts watching Tanaka throughout the 2013 season. The Yankees need pitching, but there’s another reason Tanaka may appeal. While the total outlay to get Tanaka on the team will be significant – Yu Darvish’s $52m posting plus $60m contract is a good starting point – not all of it will count towards the new, more stringent, luxury tax. While the Rangers’ $60m contract to Darvish was breathtaking at first, he’s now making $10m in AAV, less than guys like Andy Pettitte and Ryan Dempster last year. The total will be higher, but the hit to the payroll may come in less than the Tigers’ $80m deal for Anibal Sanchez last year, and will certainly be far below Zack Greinke’s deal. If you have plenty of money to spend but not quite so much that you can afford to blow off the luxury tax, a guy like Tanaka’s perfect. So why wouldn’t he be perfect for the M’s? The M’s know at least as much about NPB-imports with plus-plus splitters as the Yankees do. Why were they never a serious player for Tanaka (or Abreu, for that matter)? It’s a good question, really. The team has money to spend, and clear needs both in the line-up and the rotation. I think many of us have been more concerned that Zduriencik on a one-year extension had an incentive to focus on 2014, damn the consequences, so it’s a bit odd that they’ve been silent. Of course, everyone knew that Yoenis Cespedes would head to Miami or the Cubs right up until he didn’t; we don’t know where Tanaka will end up, but the M’s haven’t been connected to him at all, just like they weren’t connected to Abreu and weren’t connected to Cuban SS Alexander Guerrero. The M’s haven’t made a splash in the international market; they got Iwakuma for peanuts after shoulder woes tanked his value. I’m not suggesting that they should just to shake things up, but I do wonder how the M’s front office sees guys like Tanaka and Abreu…and, perhaps more importantly, I wonder how they see their own current roster. I’ve been taking a break from Marinerland recently. Instead, I’ve been following the post-season, watching football and soccer, and attempting to communicate with my family without making analogies to ex-M’s prospects, or lapsing into Eric Wedge imitations. In the spirit of attempting to re-establish communication with this wordpress window and thus with all of you, please accept these bullet points. 1: Jeff’s already mentioned it, but this postseason has been, for the most point, a joy to watch. You can certainly quibble with the teams that have advanced thus far, but the games have been great to watch from this neutral fan’s point of view. There have been several brilliant pitching performances, from Verlander’s last night, Wainwright’s complete game, Sonny Gray’s first appearance versus Detroit, and Gerrit Cole’s first game against St. Louis. But I wanted to talk about Wacha’s for a moment. Even after seeing him in person this year, I’m still a bit surprised by his ability to both miss bats and generate some sickly looking swings by elite hitters. He’s primarily a fastball-change pitcher, but it was his use of the curveball against Pittsburgh that gave a partial explanation. Pace the TBS announcer who weirdly announced late in the game that Wacha had thrown *only* FBs and changes, Wacha threw 14 curves to Pittsburgh. It was never used leading off an at-bat; instead, up until his final inning, he always used it after a fastball. Specifically, after a *high* fastball. Why? As Josh Kalk (now with the Rays) pointed out back in 2009, it’s a great way to delay the point at which batters are able to pick up the difference in movement. In general, a fastball and a curve are so different in trajectory and velocity that it can be easy for hitters to differentiate the pitches. But a high fastball and a curve look similar for longer from the batter’s point of view. This helps to explain how lost Starling Marte and Marlon Byrd were against the Cards rookie. What’s kind of amazing is how the more I look back on the game, the less command of the hook Wacha appeared to have. And he threw it to 10 batters, only one of whom reached base – that’d be the last batter he faced, Russell Martin, who walked. That was the only time in the game Wacha wasn’t able to set up the hook with a high fastball. To every other batter who saw a yellow hammer, Wacha had previously thrown a fastball at or above 3′ off the ground. Many were well out of the strikezone and were taken for balls – like a ball to Byrd in the 2nd, and the first pitch to Martin in the 3rd. At other times, like the first pitch to a completely flummoxed Byrd in the 5th, Wacha threw the pitch for a high strike, setting up a garbage swing on a curve low and in the dirt. But even in that at-bat, Wacha threw one curve very high and out of the zone (which Byrd laid off of). He threw another such curve to Charlie Morton, and one to Andrew McCutcheon – both were put in play, as their trajectory should’ve been easy to see. But both were fairly routine outs, as you might expect when a batter makes contact with a ball out of the zone. I’ll be fascinated to see if he repeats this pattern in his next game against the Dodgers. With better command, five days rest, and pitching at home, it could be quite a game for Wacha – despite LA’s rampaging offense. Wacha reserved his curve ball to right-handers against Pittsburgh – giving lefties a traditional course of fastballs/changes. The Dodgers (like most good teams) have lefties who can hit – Adrian Gonzalez, for example, but the middle of their line-up is very right-handed: Puig, Ramirez and Uribe are all righties. 2: The Arizona Fall League’s already underway, and several M’s prospects have put in appearances with the Peoria Javelinas. Brandon Maurer got the start today, and the ex-prospect was again knocked around early. He looked much better down the stretch, but apparently looked fairly ordinary today, as he gave up three hits and two walks (no Ks) in 1 2/3 IP. It could’ve been worse; Maurer’s catcher, Austin Hedges, picked off a runner in the first who would’ve scored otherwise later in the inning. Hedges is routinely tabbed as the best defensive catcher in the minors, so it’s unlikely that Maurer’s control problems were due to lackluster receiving. Carson Smith, Dominic Leone and Kyle Hunter have pitched in relief for the Javelinas. We’re most familiar with Smith who played for Peoria last year and looked unhittable in spring training with the M’s back in March. The sidewinding righty throws a hard, hard sinker at around 92-93, and has a wipeout slider. Dominic Leone had a great season, rising to AA in his first full season in the org after being drafted in the 16th round out of Clemson. The short right-hander showcased a mid-90s fastball and a hard slider/cutter thing in the high 80s. Hunter’s a left-hander who replaced Danny Hultzen on the roster after Hultzen’s shoulder unpleasantness. He’s used a very straight 85-88mph fastball, a cutter, a curve and a change/split-type pitch. Way too early to tell much on the hitters, but SS Chris Taylor, LF Stefen Romero, 3B/DH Patrick Kivlehan have all appeared to date. 3: The Venezuelan Winter League started yesterday, with several M’s and ex-M’s in action. Logan Bawcom got the hard-luck loss in Lara’s opener when a throw to the plate was dropped by ex-M’s catcher Jose Yepez, allowing the winning run to score. M’s farm-hand Gabriel Noriega played SS in the game, but the oddest line score came from Brodie Downs, the surveyor-turned-unlikely-draft-pick turned retired minor leaguer. Downs pitched an inning for Lara, after (apparently) not pitching competitively for three years. Jesus Montero’s obviously the guy to watch on the club, as he attempts to restore a modicum of his prospect sheen and I’m finding it difficult to care too much about that given that Chris Jakubauskas is also on the roster. 4: As they did last season, MLB’s got a handy page of winter league stats by MLB organization, so if you’d like to keep tabs on the M’s players, go here. One thing we know for sure: Ken Rosenthal reported the other day that the Mariners had expressed interest in Lou Piniella as their next manager. Beyond that, Rosenthal’s source indicated that the Mariners put on a “full-court press” to try to lure Piniella out of retirement. Ultimately, Piniella said no to the potential opportunity, deciding he’s rather quite fond of his current living arrangement, which involves a lot of not being in charge of the Mariners. One thing we probably know for sure: Rosenthal’s report wasn’t actually entirely accurate. The Mariners and Piniella have spoken, and Piniella has said no to managing again, but based on the organization’s words, it was Piniella who initially broached the subject. The Mariners simply asked if he was interested, and he indicated maybe, and then a little while later he indicated no. The Mariners say there was never any full-court press, and they didn’t seek Piniella out, and they have a very long list of managerial candidates for 2014. All in all, it wasn’t much of a story. And it’s hard to see a reason for the Mariners to outright lie about this. So in the end, nothing has changed. We’ve gone from not considering Lou Piniella as the Mariners’ next manager to not considering Lou Piniella as the Mariners’ next manager. I guess what we know now is that he’s officially out, but no one was ever really counting him in, on account of the retirement and all. To whatever extent people are thinking about the Mariners’ manager search, they’re thinking about names like Joey Cora, Bryan Price, and, regrettably, Dusty Baker. Something’ll get done in a matter of weeks. But out of this non-story, there’s a lesson to learn. When word initially spread, there were, I’m sure, a variety of responses, but a common one was that the Mariners were doing something embarrassing. People didn’t know very many details, but the immediate assumption was that the Mariners were being idiots again, humiliating themselves. Reconnecting with an old flame over the phone, trying to get something ignited. There’s long existed the criticism that the Mariners make too much of what happened in 1995. The more years that pass, the more years the Mariners fail, it only looks worse. To see Piniella’s name brought up again out of nowhere? That one wasn’t going to sit well. It suggested that the Mariners aren’t interested in looking forward. At least, it suggested that the Mariners are only interested in looking forward by looking backward. It suggested the Mariners don’t want to try to find a new direction, preferring instead to get some maps out of the attic. And a “full-court press”? That smells of desperation. Desperation to bring back the glory years by literally hiring the glory years, ignoring that the characters have aged. Rosenthal’s report felt very Mariners. People responded to that. It was immediate, it was instinct. Nevermind waiting to know more, waiting at least for confirmation. When the tweet went out, it took no time at all for fans to conclude the Mariners were making a mistake. People figured the Mariners had learned nothing at all, and there was renewed drive to burn everything to the ground and rebuild with new material. This is how people deal with Mariners news now. We’ve become conditioned to believe the Mariners are going to screw up. Worse, to believe they’re going to embarrass us and themselves. When the Zduriencik front office was still smelling new, things were the opposite. We trusted them with their decisions, because it seemed like they’d earned it. Zduriencik’s still there, but he’s not the same guy, despite being the same guy. How we feel about this team has done a 180, or, going back to the Bavasi years, a 360. When something gets tweeted about the Mariners, people automatically get nervous. Skepticism and cynicism run rampant. This was made readily evident by Rosenthal’s Lou Piniella report. The Mariners’ online fan base is such that, if the Mariners are said to be doing something, the people believe they’d be better not doing it. The Mariners, simply, don’t have anyone’s trust. But then we already knew that, even before Rosenthal’s article. So the actual lesson is nothing we hadn’t already learned, and where we are today is where we were earlier in the week, a few days closer to death. What we’ve gotten out of this experience is nothing. But at least people got to make fun of the Mariners for something they didn’t do. Keeps ’em from getting rusty. Eventually, we’ll all once again trust the Mariners. I don’t know who’s going to be in charge of the team at that point, but it’s a probabilistic certainty. Hard to imagine, that feeling. But we have felt it, not even long ago.